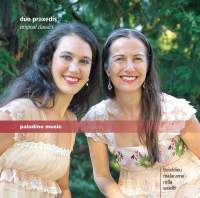 This disc from the Swiss mother and daughter Duo Praxedis (Praxedis Hug-Rütti - harp, Praxedis Genevieve Hug - piano) on the Paladino Music label explores the early 19th century repertoire for harp and piano so. So here is music by Domenico Malacame, Francois-Adrien Boieldieu, Allessandro Rolla and Josep Weolfi. The late 18th and early 19th century was a time of big technological development in both the pianoforte and the harp. Composers wrote music for the pair (often with the alternative of piano duet) because both instruments became popular in middle-class households. And in fact the combination of the two timbres works very well, Praxedis Genevieve Hug keeps her tone light on the piano which achieves a lovely balance with the harp. But I would be certainly interested to hear some of this programme on a pair of period instruments. The best known composer on the disc is Francois-Adrien Boieldieu, known now for his opera La Dame Blanche. His Quatrieme Duo in E flat Major was dedicated to Muzio Clementi and comes from the period 1796-1803. Austrian composer Joseph Woefl wrote his Grand Duett in B flat Op.37 a few years later. He was a famous pianist and performed the work at Salomon's concerts in London. Alessandro Rolla was a violin virtuoso in Milan, writing opera for La Scala. The final name in the least known, Domenico Malacame whose Tema con Variazioni in B flat was published in 1823. Some pieces are more developed than others, some written for more virtuoso techniques. All have a certain charm, and are played beautifully by the Praxedis duo, blending well with the piano not attempting to outdo the harp in volume. There are some finely bravura virtuoso moments, but some of the music on the disc was clearly written for the home market. The results are nicely put together and delightful, but four works each of which uses variation form is a little too much. By the end of the disc I was wanting something more than charm and longed for some robust grit.